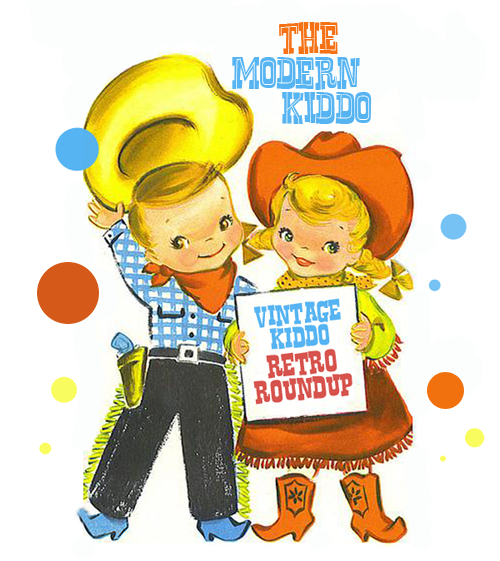 Hurrah for the Vintage Kiddo Retro Round Up! I can’t believe it is a week away from Halloween! It’s so much fun to have a kid for holidays! This weekend we kitted out the house with spooky spiderwebs, and pumpkin lights. The Peach is busting at the seams proud of our house being all “halloweenie!” And we of course try to pack as much into the weekend as possible—parties, pumpkins picking and of course folding laundry! But a weekend wouldn’t be a weekend without a bit of fun looking for some goodies for ya’ll—so let me share my finds with you! Oh how I love a good Health Tex baby shirt. Like this woofy one! From Etsy seller, Amber Rose Vintage. Talk about awkward brand extension… Mrs. Bearsley paper doll? Hmm… Kinda hilarious yet slighter disturbing. From Etsy seller Oopsee Daisies. I dream of Jeannie. The boardgame, that is! Pity it doesn’t come with a plastic Jeannie bottle. Sigh! From Etsy seller, Wonderland Toys. This sweet vintage Matryoshka nightgown would keep anyone snuggly at night. Bonus points for excellent use of ric-rac! From Etsy seller, Vintage Aga. Remember Alix’s great post on Dream Pets? Well, you can have one of them—in fact the BEST one! The little kitty with the fish in its mouth. LOVE! From Etsy seller, Greta’s Girl Den. Not into dream pets? Well, how about this sweet plaid shortall set by DeamBoat? From one of my favorite Etsy sellers, FuzzyMama. WANT WANT WANT WANT WANT WANT WANT. WANT! Vintage LIddle Kiddles with the mother loving collector’s case. WANT WANT WANT WANT WANT WANT WANT WANT. WANT! From Etsy seller, Sweet Shop Vintage. It is more a question of how can you NOT buy these sweet vintage milk chocolate shoes from Etsy seller Ms. Tips? Really! Someone needs to bring back the striped shoe lace STAT! Gasp! When I saw this, I wanted to throw out my knitting needles and just buy this because this nommy little vintage hat with wee chickens embroidered on it is just about the cutest thing on a baby. From Etsy seller, Gremlina. Now, THIS is a kickass shirt! I love the pattern. What a great way to spice up the old jeans. From Etsy seller, Lishyloo! Denim suit anyone? Denim LEISURE suit? Oh lawdy yes! NEW WITH TAG’S Y’ALL From Etsy seller, Lil’s Dog House. And why yes, she does have a few in different sizes available! dot! where can i get that suit for wolfgang ! The leisure suit RULES!!!!!!!!!!!! i love it! that nightie!! and those suits!!! Can I have one of those leisure suits please – in grown-ups size? And some leisure time to go with it! Too cute, thanks for sharing. that Chicken Bonnett is the sweetest thing ever!